Happy launch day Portians! My Time At Portia officially leaves early access and is launching on PC on Jan 15th! Happy launch day Portians! My Time At Portia officially leaves early access and is launching on PC today! New story content – Continue your quest to uncover the secrets of Portia and experience the epic finale! New side missions – including NPC quests! Start a family – have or adopt a baby with your spouse! More player customisation – including beards and face decorations! 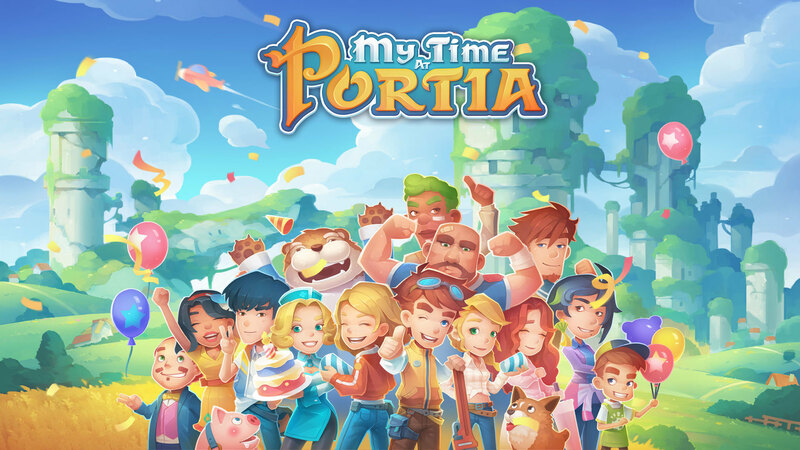 Additional language support – My Time At Portia now supports English, French, Italian, German, Spanish, Simplified Chinese and Traditional Chinese. Lastly, we’d like to a say a HUGE thank you to all our Kickstarter backers and early access players who have helped shape My Time At Portia into what it is now. We really hope you enjoy the full release and new content! Added main storyline and ending. Added the summary UI to the end. Added features after marriage, including missions relating to anniversary, birthday parties for players and spouse, and side quests. Added side quests for Penny, the singer. Added side quests for Sam. Added side quests for Arlo. Added side quests for Alice. Added side quests for Emily. Added new stories for Ack. Changed the way to hire Ack. After you become friends with Ack and have triggered Lara's mission, you'll need to pay Ack to help you. Added recipe data - Ack will need receipe data chip to cook. Added ability for Ack to plant in batch. But will need planting data chip. Added facial hair and face decoration in the character customisation interface. You can also change these styles in the barber shop. Added party system. This will require a banquet table. Added birthday for players. New players can choose their birthday when they first start the game. Other players can choose their birthday when you load the game after this update. Assembly diagrams received in missions can be purchased in the research centre. Added video tapes in abandoned ruins. Added television in game which can play video tapes that are found in the abandoned ruins. Added ordering system for single person. Players can restore their HP and obtain different buffs. Players can mine all categories of mines and find new relics in the abandoned ruins in the swamp. Map will display the name of the dee dee stop (when you hover your cursor over it). Added swing for single person. Added information filter in the map. Added and replaced several voice recordings. Added new items for inspection. Added one piece of BGM for inside the house. One of these two tracks will play at random when inside the house. Added wedding anniversary to the calendar. Added animation and effect for placing furniture. Added tips to the loading screen. Added decorations in the church for weddings. Added new relationship levels with Pinky, Scraps, and QQ. Added dating event - chatting by the sea. Added reward for collecting 60 exhibitions in museum - billiards. Added the patrol animation for Arlo, Remington, and Sam. Dawa's favor points will affect the payment to Tree Farm. Dana's favor points will affect the payment to the Mining Company. Added Alice's interaction with Jack after she gets married. Added revival after death. After death, the player will respawn outside their house. Added horse rental expiration, ruin payment expiration, and regular meeting reminders. Added the special effect of page turning. Added new diagrams and crafting recipes. Added an automatic reminder for the Sunday meeting event. Added king fish. There are now 'king' types of all fish. Added king fish collection in the museum. Added monsters in the swamp during winter. Added Chief Honcho in hazardous dungeon in the desert. Added flying mount - robopig rider. Added the function to get food directly without waiting. Players can replay several cutscenes in the album. Added Game Speed in the settings, which can extend the in-game day. Added fishing spot in map. Added special effects on UI. Added shortcut when interacting with NPCs. Added the position adjustment feature for exhibition items in the museum when you have a good relationship with Merlin. Added number above the scrolling bar in settings. Added more sound effects in game and added BGM & sound effects for cutscenes. Added different sound effects when fighting different monsters. Added exclusive attacking animation for Mint. Added stamina consumption for several holidays and events. Added the highlight feature for Nvidia. Added time display while fishing. Added animation of playing the drums. Added devotion in the relationship. Will need to have 1200 favor points with your spouse. Added new conversations for Gust when you propose, confess, date, and send gifts. Added a wedding photo to the story album. Added closet, plant rack, and weapon rack for classify items. Added new greetings. Player's spouse will call player "Darling". Added a time limit to Gust's conversation after The Second Key mission. If you missed the conversation in this time limit, you will not receive it again. Added daily routine for llama. Will add more behaviors for monsters. Added a naming function in the storage box interface that allows players to edit the name of the storage box. Adjusted the upgrade time for the level 2 Relic Scanner. It can only be upgraded after Ack has been fixed. Adjusted the expiration time for building the Portia bridge. Changed to 7 days. Adjusted the issue affecting the description of the Portia bridge mission being different than the mission itself. Adjusted the regular meeting time of Ack and Mint. Adjusted the mission release time of building the musuem. Adjusted the reminder time for the mission to fix a pipe. The player will received a reminder before the mission. Cancelled the time limit for missions relating to the Farm Tree and the lift. Adjusted the required item number from 20 to 10, in the mission Umbrellas Are Important. Adjusted the rewards for missions. Adjusted the difficulty and the required completion time to the South Block mission. Adjusted the material consumption of the mission The Desert Wind. Adjusted the trigger time of the harbor construction and shortened the required time for completing them. Optimized the operation of controllers and updated the guidance. Optimised the playing experience in the side quests of Gust, Mint, Emily, and Arlo. Optimized the texure of the ground in town. Optimized the pathfinding of NPC when they're outside of the town. Optimized the pathfinding of NPC in town. Optimized the events for the wedding day. There will not be any other arrangements on the wedding day. Adjusted the relationship points decrease when you break up or get divorced. The relationship level will go down to stranger if you get divorced and down to friend if you end a romantic relationship. Changed the payment method to the Tree Farm and Mining company to a monthly payment. Optimized the UI. Adjusted the distribution of monsters. Adjusted the attribution of All Source. NPC will not hold an umbrella when taking a group photo. Adjusted the gifts and the gifts in the wishlist. Adjusted the icon above NPC's head. When an NPC is in the middle of a mission, the mission mark will not show above NPC's head. Adjusted the loading picture when getting into the sewage plant dungeon and desert dungeon. Adjusted the attribution of several necessaries. Adjusted the appearance of several items. Adjusted the sell condition of several main story related items. Adjusted the number and type of items for sale. Adjusted the drop rate and the reward rate of several items, and lowered the difficulty of obtaining them. Adjusted lip colour. Players will need to visit the barber shop to change the colour. Adjusted the way to dye furniture. The player will need to have pigments in hand to change colour. Adjusted four seasons images used on the main menu. Adjusted the minimum value of the favor point from 0 to -50. Adjusted the buff effect from eating hot pot during Winter Solstice. Adjusted the maximum value of the favor point between you and your spouse from 1000 to 1200. The other NPCs maximum value of favor points remains at 1000. Adjusted the length of the Autumn Festival music. It will last throughout the whole day. NPCs in the house will not say goodbye. Adjusted the number of monsters in several rooms inside the hazardous dungeon. Adjusted the volume of several sound effects. Adjusted the position of Sophie. She will stand by Emily's stand during Winter Solstice. Fixed the animation bug when Paulie has dinner in the restaurant. Fixed the bug that players cannot interact with NPCs on the first day of the Portia Land Run. Fixed the bug causing an error with the players name after the Martial Arts Tournament. Fixed the issue of NPCs fighting each other. This update will fix the issue for all save files. Fixed the issue where the advanced factory is in the wrong place. The player will need to move the factory in A&G Construction. Fixed the issue that rooms in the hazardous dungeon do not match the mark on the map. Fixed the issue that Ten and Ryder can be passed through after the cutscene. Fixed the bug that the elevator inside WOW Industries can push players away. Fixed the bug that when players get out of the school and the museum, they might fly to the sky. Fixed the wrong item in Arlo's wishlist. Fixed the wrong animation when Paulie is having food during the Autumn Festival. Fixed the bug that caused the special effect of throwing a snowball to be missing. Fixed the bug causing the incorrect weather icon to be shown in the relationship interface. Fixed the bug causing an error with the time shown after the Martial Arts Tournament. After the Portia Land Run, players will be pulled out of the racing track since the competition is over. Fixed the bug where players might disappear when loading the Portia Land Run. Fixed the bug causing an NPC to leave the sparring area when the player is sparring with them. Fixed the bug causing NPCs to have an issue getting on the stage at the Martial Arts Tournament. Fixed the bug that when NPCs are beaten in the snowball fight, they might still have points. Fixed the tips relating to seasons changing displaying in the incorrect language after changing the game language. Fixed the issue that players will hear the fighting music even they are not around the Martial Arts Tournament's stage. Fixed the bug where players may not get the camera mission if they craft the camera beforehand. Fixed the bug where Higgins will not help to repair the res of the dee dee stops once the player has repaired the first one. Fixed the description error of targets in the mission The Crashed Station. Fixed the bug after the mission The First Key where players cannot interact with Ten. Fixed the bug preventing NPCs from hitting monsters. Fixed the movement issue when holding an item with two hands. Fixed the bug causing the player to fall through the floor in several rooms in the hazardous dungeon. Fixed the bug that the relic scanner can detect the items behind the camera.